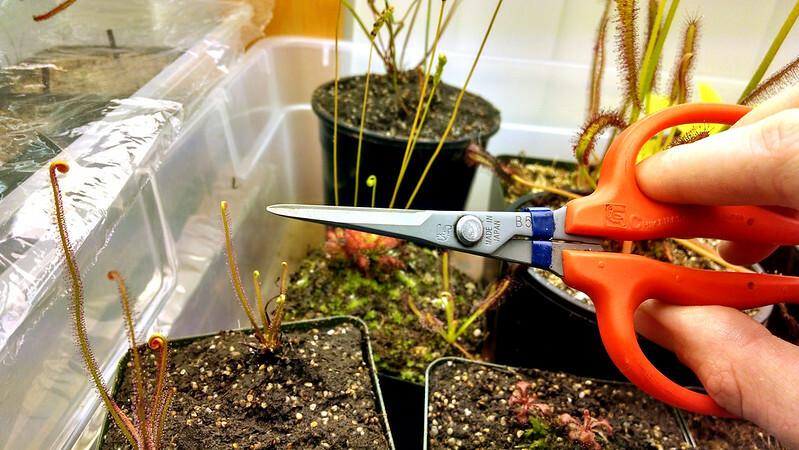 Cultivation Guides: Harvesting Seed |Sundews Etc. This is part of a series of posts describing various aspects of cultivation, which will hopefully be useful to new growers trying to solve the challenges of growing carnivores, and experienced growers who are always looking to improve their collection. The full series can be read here, or by topic on the Series page. 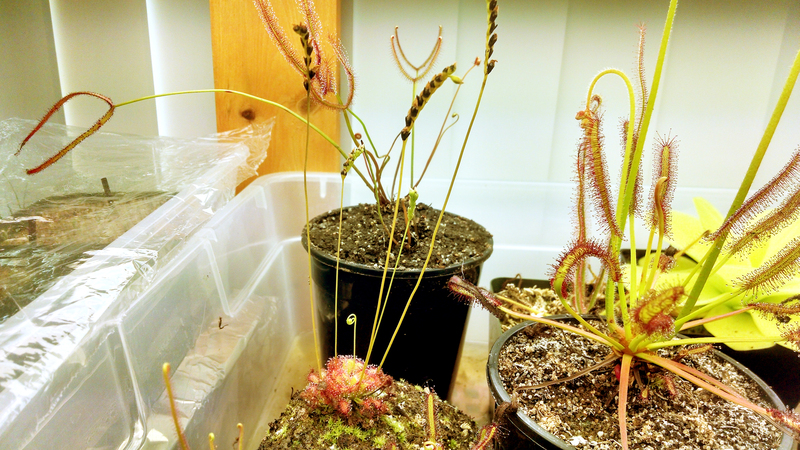 Today I decided to harvest seed from my Drosera capillaris, which has been blooming for several months. I donated some seed to the NASC auction, and I also want to get it ready to sell and to trade. As you can see, there was plenty of ripe seed to collect. Drosera capillaris with lots of nice seed. Of the 6 stalks that you can see, 4 appeared fully bloomed out with ripe seed. I went for the one that I thought I remembered as being the oldest, and went in for the kill. 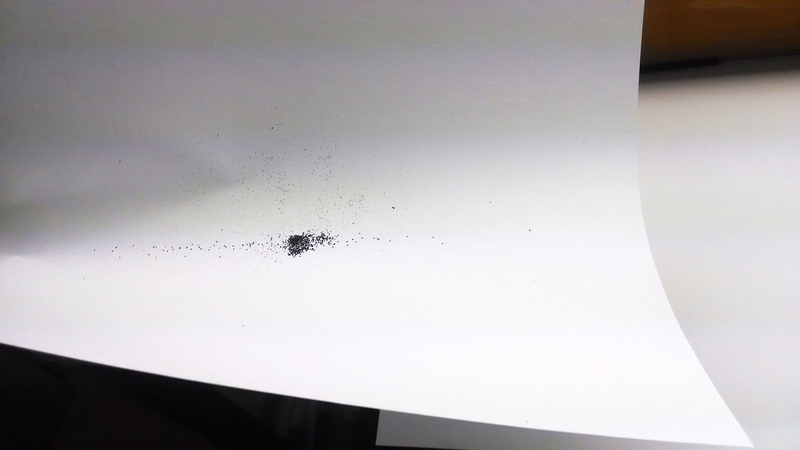 I had prepared a few pieces of printer paper to help me collect the seeds, which are super tiny. This stalk had about 12 seed buds on it. D. capillaris flower stalk. Some seed has already fallen out. 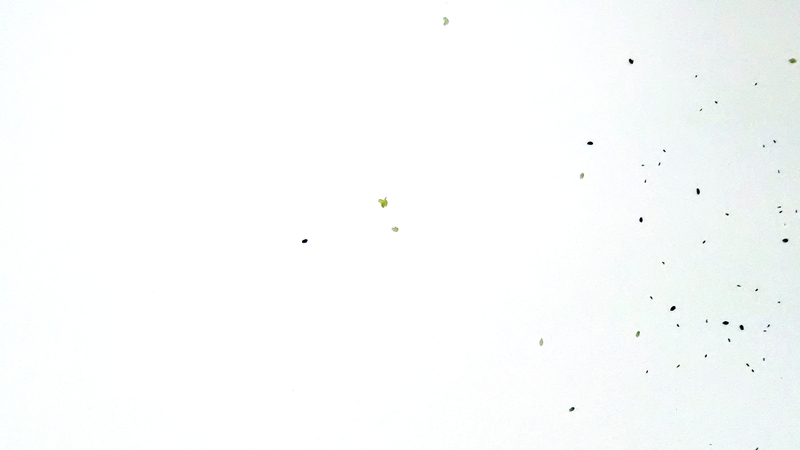 To harvest, I just tapped the top of the flower stalk on the paper and tiny little seeds came sprinkling out. After a while I was feeling like I should be getting some more out of the top buds, so I broke them open with my fingernail. This ended up being a bad move, since the top (i.e. youngest) buds weren't ripe yet, so the seed was still soft and green. You can see a closeup picture below. The leftmost seed is ripe. The ones immediately to its right are still green and too fresh to harvest. 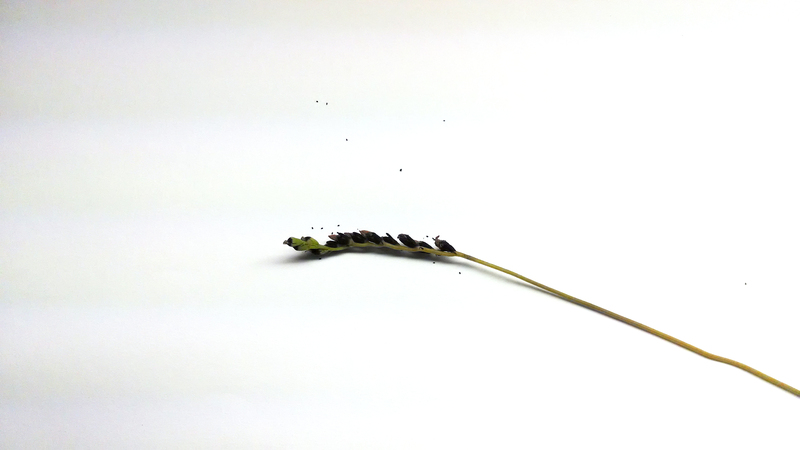 With the remaining flower stalks I shook out the ripe seed, and then set the leftover stalks aside in a folded piece of paper to dry for another couple weeks. It may be that more seed will have ripened by then and I'll get another few packets worth. Harvesting the seed also ended up shaking out a decent amount of old pollen and other plant materials onto the paper. I want to ship clean seed, since since it's important to have as few nutrients on your media as possible when starting seedlings, and all of that is just mold and algae food. Luckily, there's a pretty easy way to do this. Ripe seed is fairly hard and smooth and roundish, so it doesn't stick easily to paper. 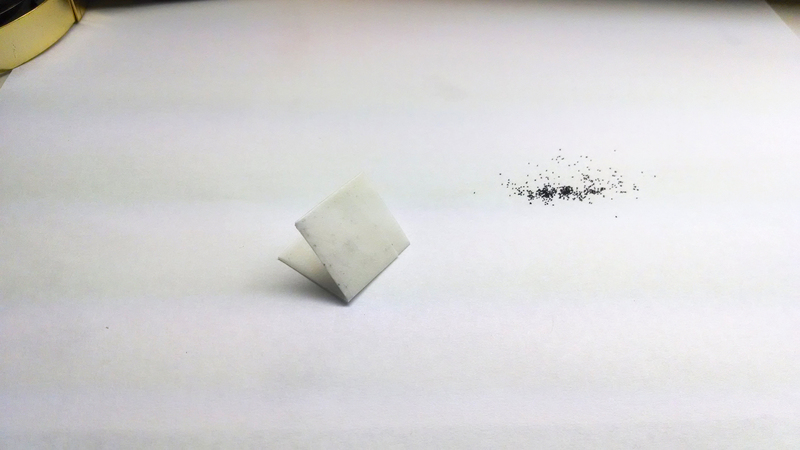 If you sort of bend the page into a U-shape, tilt it at a 30 degree angle or so, and tap it a few times the seed should all roll off and leave the detritus stuck behind. I learned this method of cleaning seeds from the ICPS website. Works great! I did two passes like this, and then individually removed any tenacious junk with a toothpick while looking through my two magnifying glasses. I really need a decent loupe. 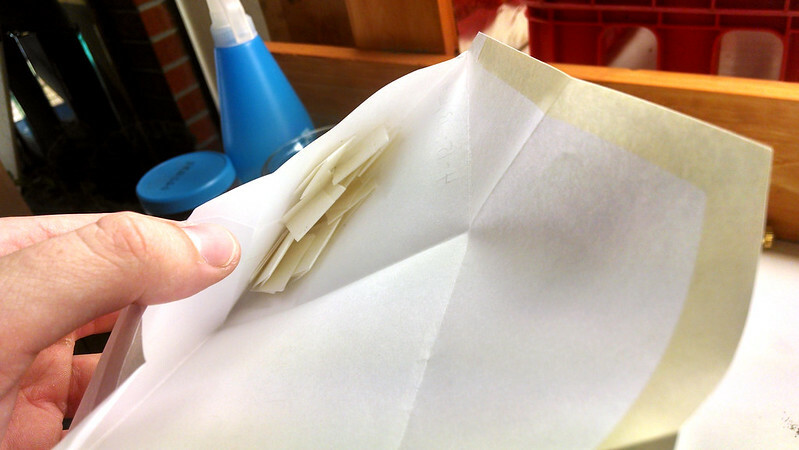 After cleaning, I packetized the seeds in parchment paper. I cut squares about 2 in. by 2 in., and then folded inwards into thirds in one direction. Then I tapped the seed into the packet, counting 50 seeds plus a bit extra into each. I then folded into thirds again the opposite way to (mostly) seal in the seeds. It's important to not use tape or glue with these guys, since they're so tiny and liable to get stuck. Seed packet. There are about 50 seeds in here. In all I collected 13 packets of 50-60 seeds each for sale, plus 3 packets of around 75 for the NASC auction. I also left myself about 100 seeds to sow at home, which I plan to do soon. I don't know if D. capillaris needs cold stratification to germinate, so I think I'm going to split the remaining seed between a few pots and do an experiment. Thirteen D. capillaris seed packs, ready for storage. Lots of potential plants in this envelope. 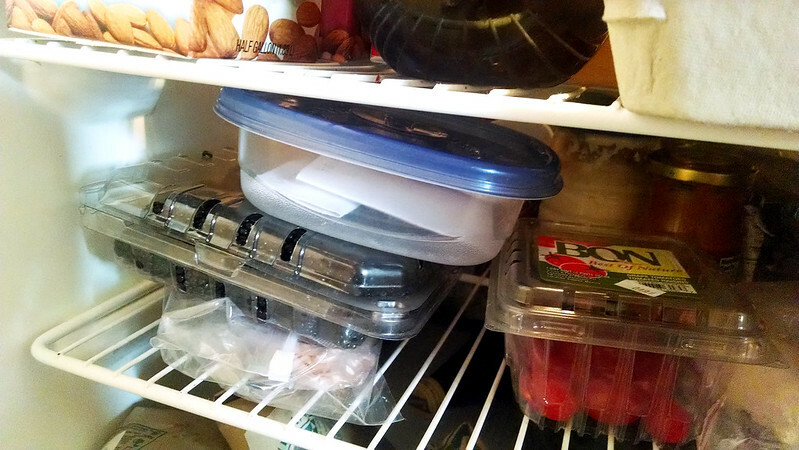 The seeds went into an envelope, which went into a plastic container, which went into the fridge. I recorded the harvest date and number of packets, so I'll be able to keep track easily. If anyone wants Drosera capillaris (Alabama) white flower seeds, now is definitely the time to get it! Check the sale page, I just put up a PayPal button. These seeds can stay viable for a very long time kept cool and dry in the refrigerator. In the meantime, my little D. capillaris is sure looking spry with its new haircut. 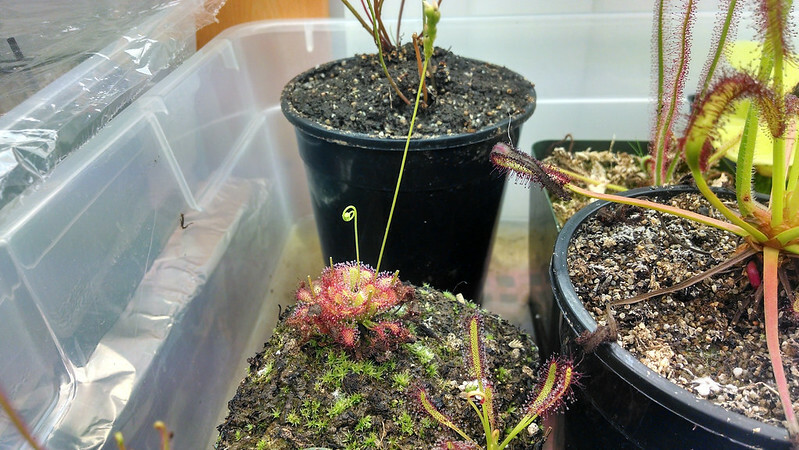 Now the D. capensis hitchhiker is looking even bigger. Got to dig it out soon. Hi. You could use zip locks which sit than on a opened cardbox in the fridge.